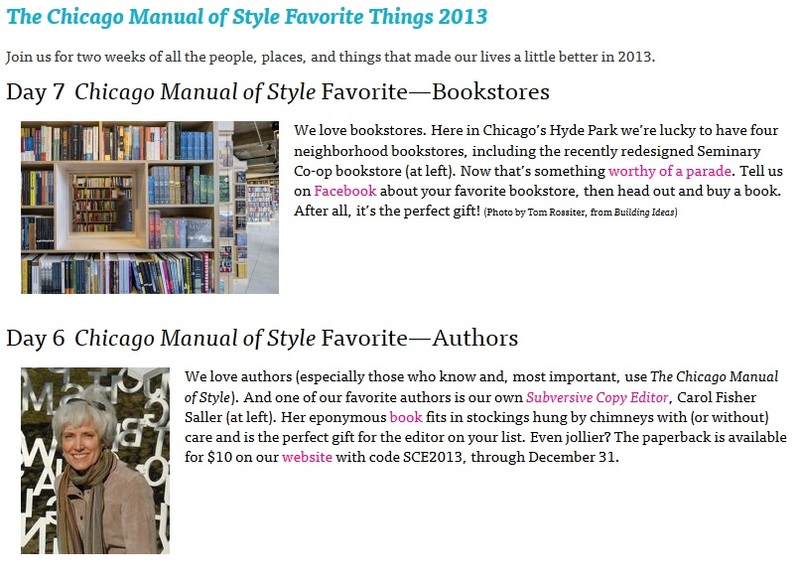 Our colleagues at the Chicago Manual of Style blog have been counting down the days to the new year with a series of short features on their “Favorite Things” from 2013. Have a look at the site here, or by clicking the image above—you’ll find fodder and stylistic ephemera, from bookstores to champion and preferred typographic treatments to foolproof dictionaries and nods to college English teachers. Among those favored? Our own Carol Fisher Saller, author of The Subversive Copy Editor, whose eponymous book is available via the University of Chicago Press website through December 31 for $10 (with discount code SCE2013). Happy holidays from and for everyone who works with words!